Elizabeth M. Burns, MD is an Atlanta native and a Board-Certified Dermatologist. After graduating from Emory College with Highest Honors, Dr. Burns continued her education at Emory University School of Medicine, excelling in both medical school and residency. After completing her residency in dermatology at Emory, she joined Perimeter Dermatology in 2005, where she leads the practice with Dr. Cox. Having suffered from severe eczema as a child, Dr. Burns empathizes with her patients and understands the profound impact skin conditions can have on quality of life. She is a firm believer that truly successful treatment is based on trust, empathy, and an overall understanding of not just symptoms, but also of what a patient may be experiencing emotionally and physically. Dr. Burns enjoys caring for the entire family (patients of all ages), providing the highest quality of comprehensive and compassionate care. 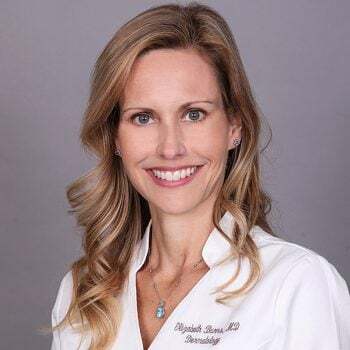 She specializes in general, surgical, pediatric and cosmetic dermatology, and thrives on working with her patients to achieve optimal skin health. She is especially passionate about skin cancer prevention and early detection, as well as treating chronic conditions such as acne, eczema, and psoriasis. Dr. Burns provides clinical oversight for our renowned aesthetic and cosmetic dermatology center. She also specializes in injectables such as Botox and fillers to give both her male and female patients natural, aesthetically-pleasing results.